We are going to enter our first real derby race and need some advice. I don't want to invoke anyone's ire but we (or should I say I) am completely overwhelmed by the amount of tools, skill and supplies needed to help my 7 year old have a decent car. Right now I am trying to focus on one thing at a time. We have the wedge, we have the weights and axles, now I am looking at wheels. I am guessing we should have started this process sooner since our derby is just around the corner... but here we are. My question is, am I limited to out of the box wheels? I can tell you I will not have a clue about how to prepare them or polish them nor will I have the tools. 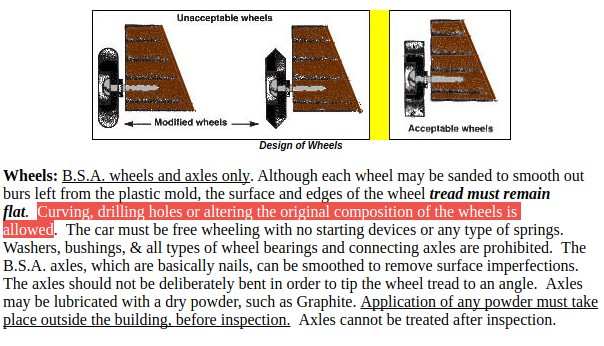 So, is it acceptable with this rule set to buy some lightly sanded wheels and where can I get them? I have seen DD 4H and D Dust mentioned on some boards I have looked at. We are a fairly new pack and we are definitely noobs (as the kids say) to the Pinewood Derby. I don't want my son to be disqualified or on the flip side, unprepared, because of our lack of.... well... everything. I've got a video series on YouTube that shows how we do wheels and axles, it's a good palace to start. There's lots of videos and tutorials out there, and DT is a great resource. Above all, remember that this is supposed to be something fun you do with your kiddo. Don't stress out or get overwhelmed, your son won't remember who wins the race, but he will always remember what you do together. welcome to derby. May want to point that out to the race organizers. That said, unless you're expecting really tough competition, you're probably fine just buying a few extra tubes of wheels and doing spin-tests on them to find the ones that wobble the least, and then focusing on polishing axles and wheel bores. You'd have to do axle and bore prep even if you bought the trued wheels, so it's a given anyhow. What would all of you say is the most important factor (axles, wheels, aerodynamic body shape, graphite)? I am going to try to get him to sand the body as good as he can and focus on putting the wheels and axles on (no clue the correct way but we will learn as we go). Patience is not his forte. He has told me that he will be decorating it with Sharpies. Car body doesn't matter. Get the weight right and focus effort on wheels and axles. If your axles are polished and smooth, your wheels are true and straight, and you weigh in at 5.0 with you COG correct, you will do fine. Perfect wheels, axles, and weight on a square block of wood can still win the race. Routing is hard (IMO). I have never been up to doing that. If I want a superlight body, I will cut out a section of the body with the scrollsaw and then glue a piece of 1/64" birch plywood over the void. (This design does use an extended wheelbase, just FYI). How much difference does extended wheelbase make over the standard axle slots? Not a huge difference. IMO, an extended wheelbase makes the car more stable and easier to tune. Also, moving the rear wheels back gives you better weight distribution and energy transfer. That said, it's a minor consideration. If you wanted to use the design I shared with slots, you'd have to move your weight holes around a bit. Otherwise everything would be the same. You remind me of the 1st Pinewood Derby my son and I entered. That was in 1985. It has become my year around Hobby. If you will send me an email I will show you some gifts I would like to send you. I think it will help make your experience with your son enjoyable and very easy since this is your 1st time. This is my gift to you. I don't sell anything. Bill, I sent you an email. Thanks! Also we drilled weight holes like the ones in the PDF.... I bought a mixed set of tungsten weights.... should I be using tungsten rods instead or does that make any difference? For drilled holes, tungsten rods will fit most easily. Depending on the shape of your weights, you may need to cut different kinds of cavities.